In the weeks that followed the eclipse, the wildfires in Oregon became much worse. As a result, the smoke from them caused us to change some of our travel plans on our trip back east. Not only was it difficult to breathe, but the scenery was less than appealing. 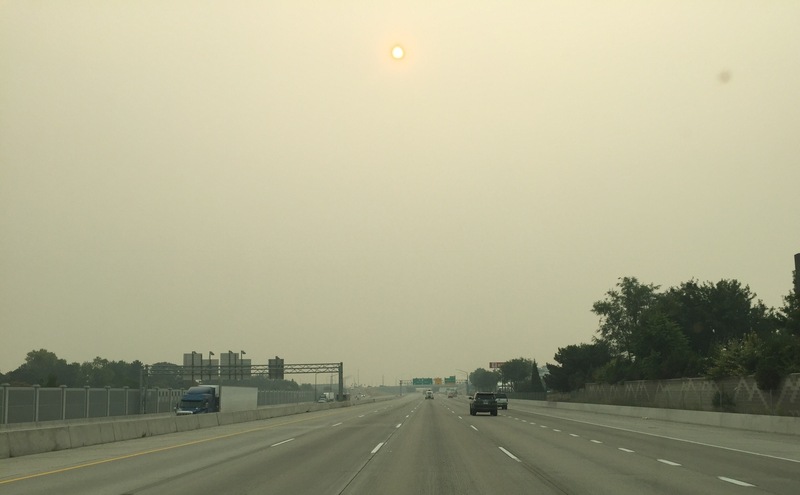 As we drove through Boise, the late morning sun could barely get through the smoke. There was only one thing that would remedy this…. 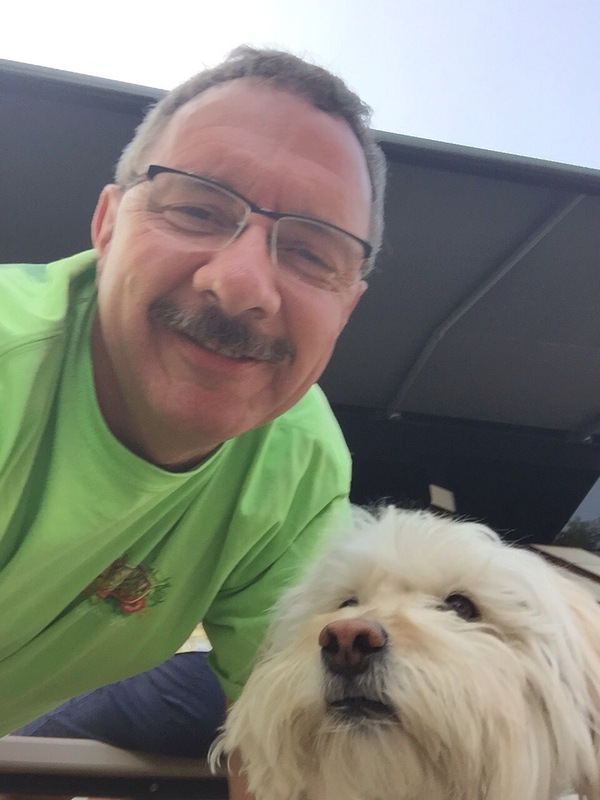 …a meet up with Fluffy Dog! 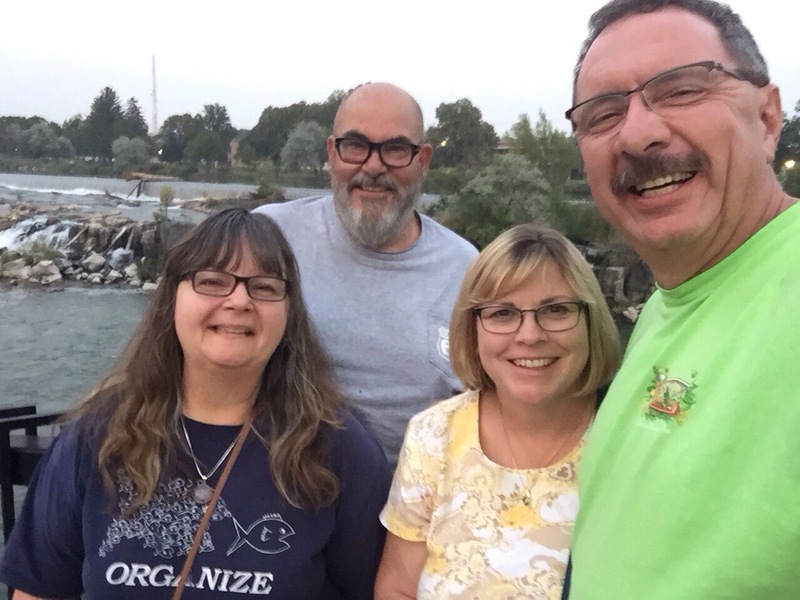 Tessa and her parents were doing the same thing we were, and so we pondered our options over dinner in Idaho Falls. It’s always a good day when we get to see Jodee and Bill (and Tessa too!). 😀. The next day, they headed southeast and we drove north into Montana, then east. 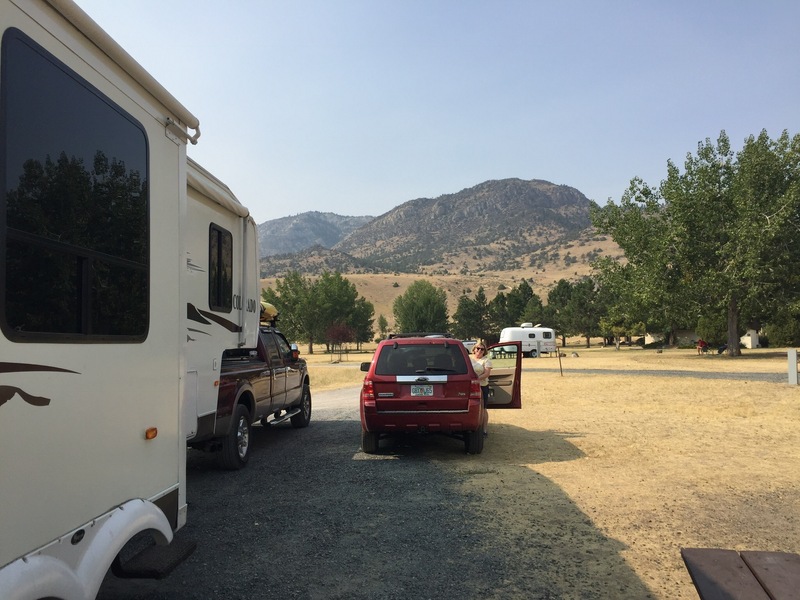 Our first stop was Lewis and Clark Caverns State Park. 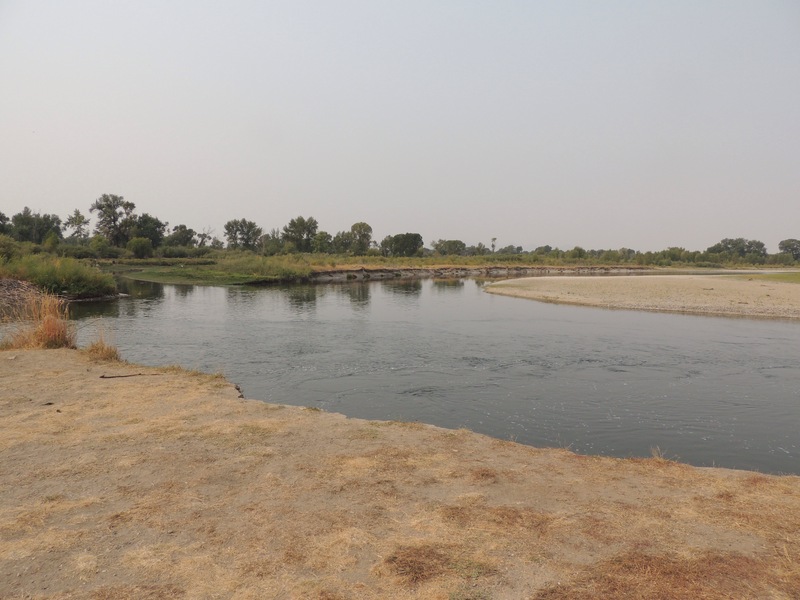 This is where I discovered my family connection to the Lewis and Clark expedition that I detailed in my previous post. We also spent time the next morning exploring the town on Three Forks, which is the location of the headwaters of the Missouri River. 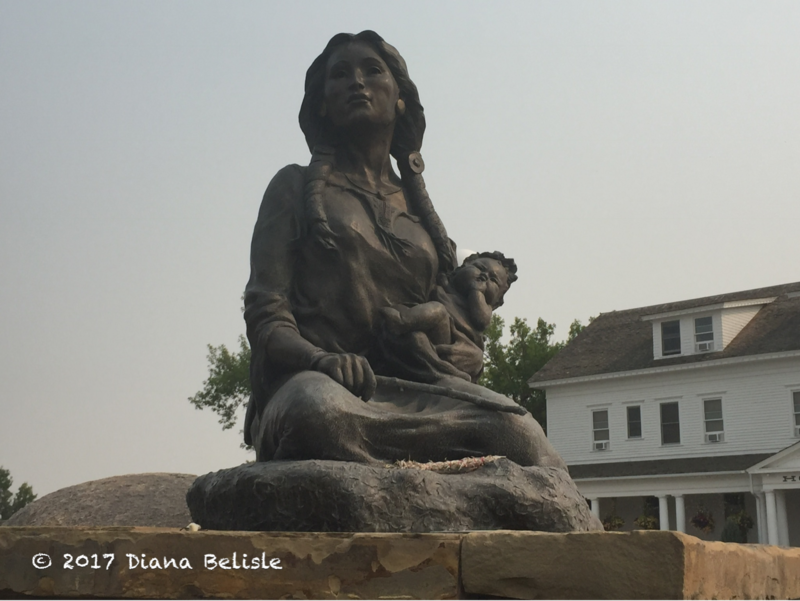 In the center of town is this beautiful sculpture of Sacajawea and her baby Jean Baptiste. A little east of town, the Madison and Jefferson Rivers merge to create the Missouri. That’s the Jefferson at the top, and the Madison is coming in from behind the brown weeds at the left. The Missouri flows off to the right. The next day found us in Bozeman to see the Museum of the Rockies. 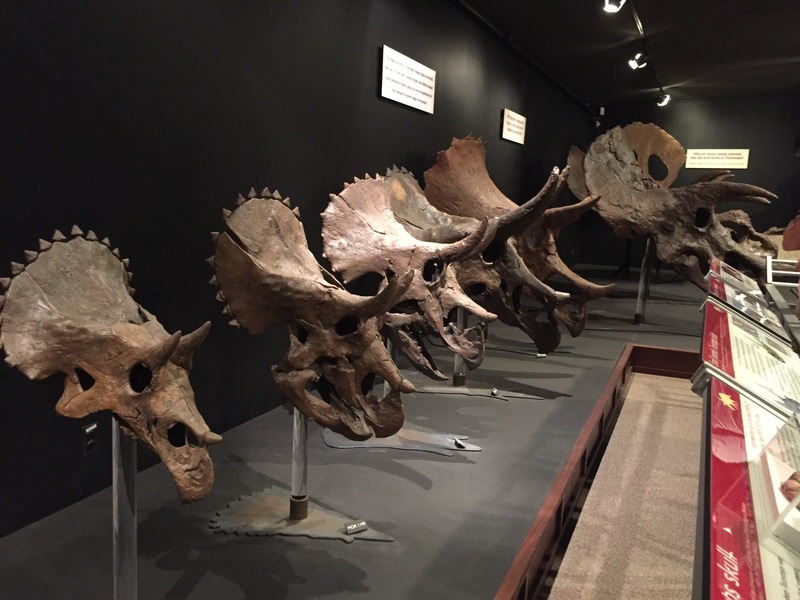 This museum mainly focuses on dinosaurs found in the area. 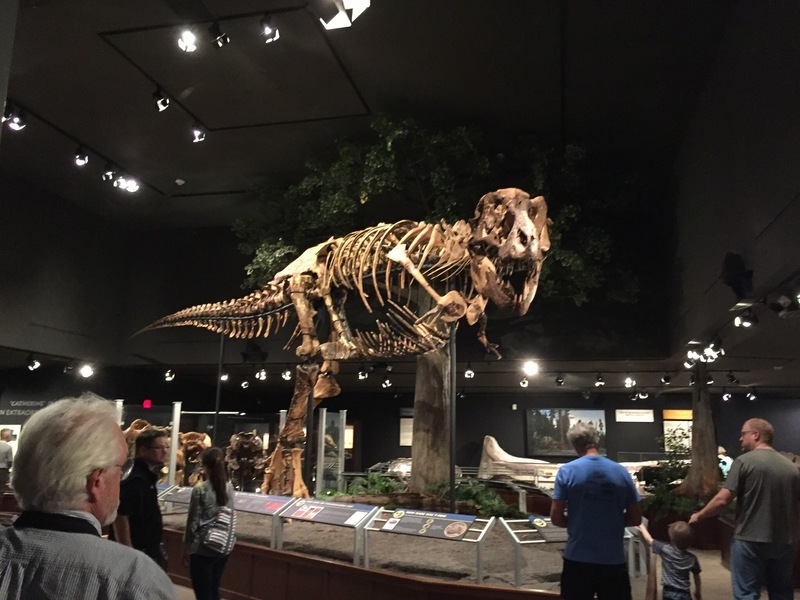 They have more T Rex skeletons than any other museum in the world…13 of them! Not all are assembled though. This progression of Triceretops skulls was really interesting, as it showed the bone structure at the different ages during their lifespans. These are all real skulls! The next day, we headed east to Pompey’s Pillar. This is a large sandstone tower along the south shore of the Yellowstone River. It was given the name by William Clark, after his nickname (Pomp) for Sacajawea’s son. 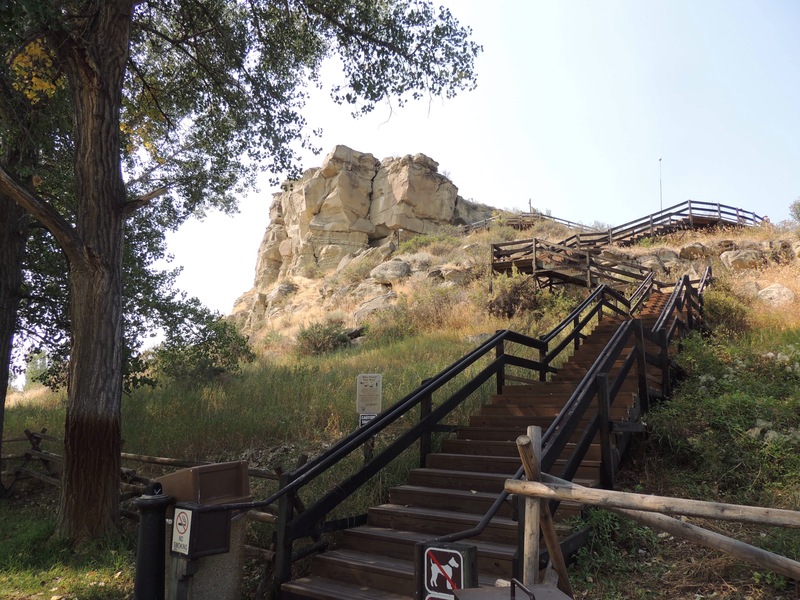 It also has the historical designation of having the only physical evidence from the Lewis and Clark expedition on the trail…. 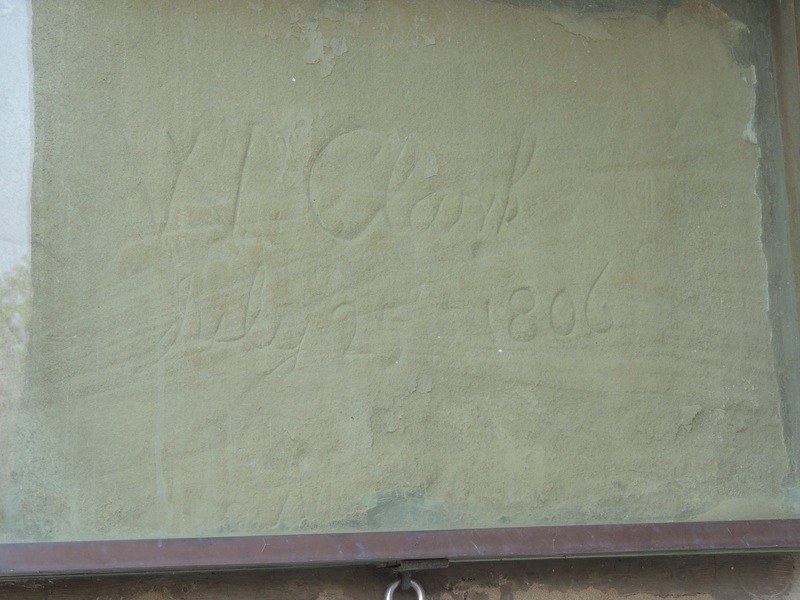 …as it is where Clark became a graffiti artist on July 25, 1806. There is a protective glass case covering his signature. From there, we turned south for a bit. First stop was the Little Bighorn Battlefield. This is where George Custer and 700 troops charged into a native camp containing upwards of 2000 warriors, based on incorrect information as to the size of the gathering. It was a huge defeat for the American army, to say the least. 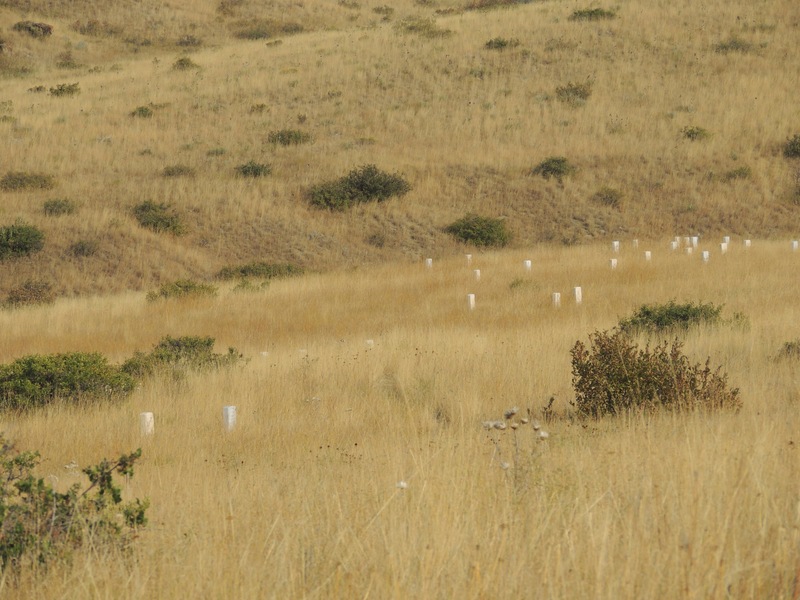 White markers denote where soldiers fell, and red granite headstones were placed where the natives died. 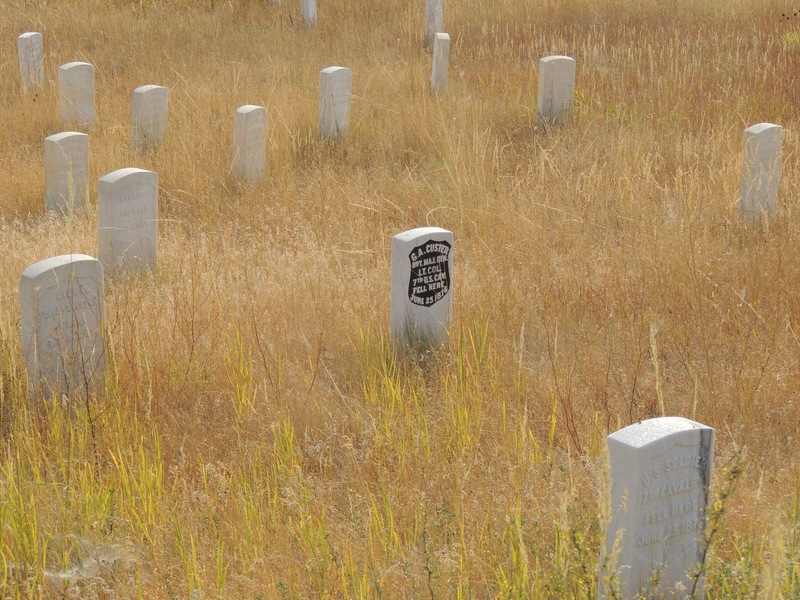 Here is where George Custer made his last stand. We found this battlefield to be a complicated, interesting and unsettling place…one that requires more study on my part. 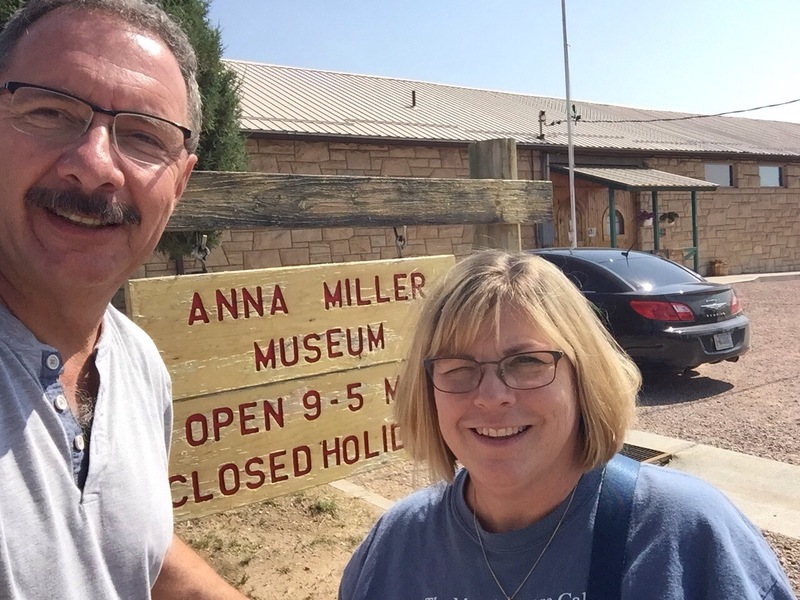 Our last stop in Wyoming was a little place in Newcastle called the Anna Miller Museum. 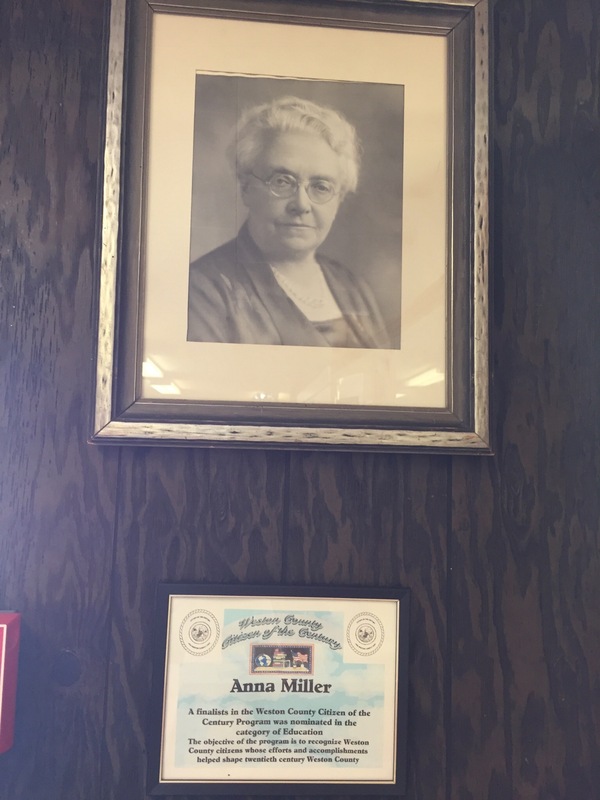 We have a friend name Anna Miller, so we had to stop and check it out! The Newcastle, Wyoming Anna was the wife of the Weston County sheriff before he was killed in the last Indian battle in the area. 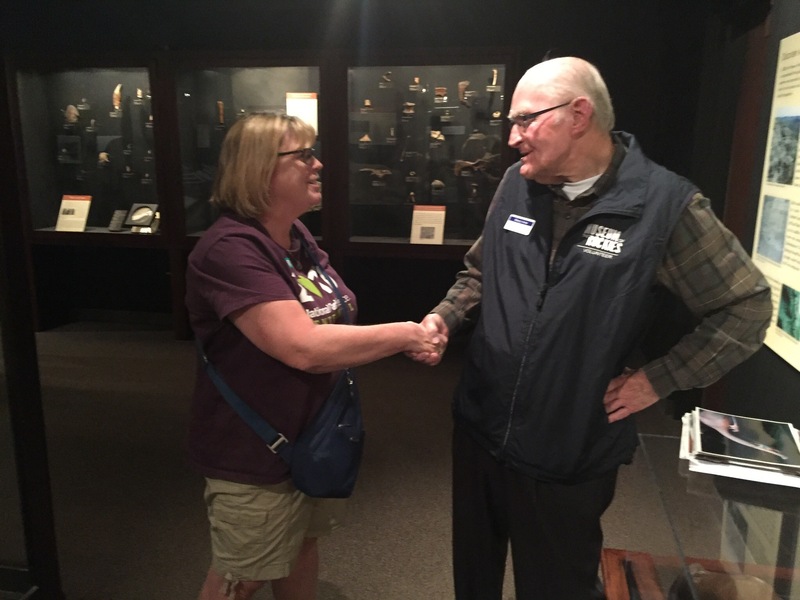 She went on to become an influential citizen in the community: serving as a teacher, their first librarian, and as their school superintendent. The community named their historical museum in her honor. It was a nice collection of Americana…definitely worth a stop! With that, we headed east towards South Dakota and a really fun couple of days. Stay tuned, as we will detail that in our next post! Click here for a selection of books on the Little Bighorn, plus other great items on our exploRVistas Amazon link!